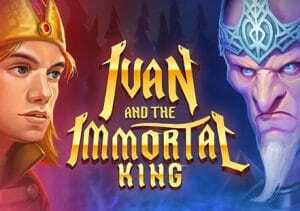 We’ve seen plenty of video slots based on Chinese folk tales but not so many from their Russian neighbours but that’s just what’s on offer in Ivan and the Immortal King. Created by Quickspin, it’s a 5 reel, payline video slot that comes with a free spins round where collecting scatters takes you through the levels to bring multipliers of up to 20x into play. Look out too for random appearances from a witch who can transform symbols. Play on your PC, tablet or mobile devices from between 20p and £100 per spin. This is another terrific looking addition to the Quickspin catalogue. With a woodland in the background, you’ll see gemstones, a 3-headed dragon, a wolf, a princess and the Immortal King Koschey spinning around the reels. Top of the payers is the potential king slayer Ivan who will get you an award of 20, 20 or 100 times your bet if you land 3, 4 or 5 in combination. Those same payout amounts are from the wild which can appear on all 5 symbols and substitute for everything except the scatter. Spicing up the action are 2 bonuses. Baba Yaga Surprise feature – on any spin, a witch called Baba Yaga can stir into life. She’ll cook up a spell which will either fill 4 adjacent positions with the same matching standard symbol or wild, or add extra scatters into play to trigger the main feature. Free Spins feature – landing 3, 4 or 5 scatters from Baba Yaga or via the base game will get you 10, 14 or 18 free spins. You can add to these by collecting progress scatters. For every 3 you amass 4 extra free spins are added to your total and a multiplier increase. Work your way through all of the levels and you’ll end up with 30 free spins in total and a multiplier that will send payouts rocketing by 20x (on your last 4 free spins). We rarely have cause to complain about the design of Quickspin video slots and Ivan and the Immortal King is another superb looking game. The cartoon imagery is terrific and the gentle, piano heavy backing track is superbly done. The bonus features are pretty simple but the free spins round has plenty of potential thanks to the multipliers on offer – to the tune of 40,000 times your bet with the 20x multiplier! We’re a bit rusty on our Russian folk tales. Who cares though when the results are as impressive as this. With its top design and potentially explosive feature, we’re happy enough to recommend a trip with Ivan on his quest to destroy the Immortal King.